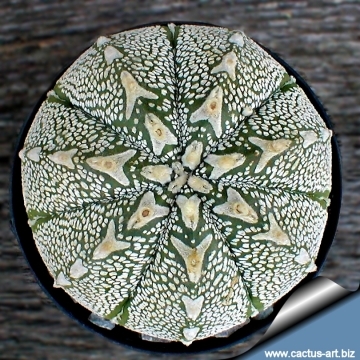 Description: This peculiar plant is the result of crossbreeding between ♀Astrophytum asterias and ♂Astrophytum myriostigma cv. Onzuka and shows some interesting intermediate features of both the parents. 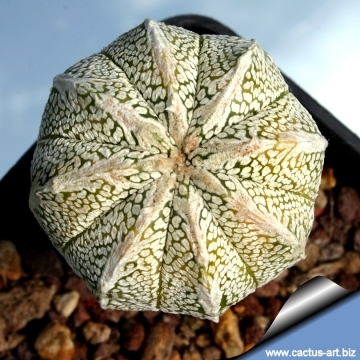 In F1 cactus hybrids the plants usually show a body shape similar to that of the mother plant and an intermediate mix of other characters. The superb feature of of this hybrid is due to the intersection between the traits of the ancestors. 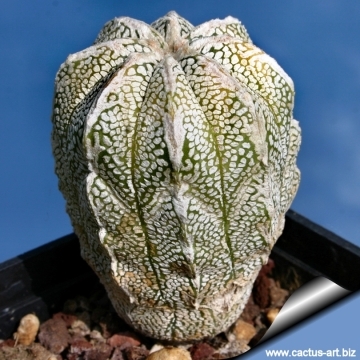 Many of them have inherited by Astrophytum asterias the 8 fairly flat ribs and by the Astrophytum myriostigma cv. Onzuka the large white dots along with the typical fly pattern around the areoles. The flowers are also very beautiful. This is one of the best, but very difficult to obtain, hybrids, because A. asterias usually fail to interbreed with A. myriostigma. VERY RARE. 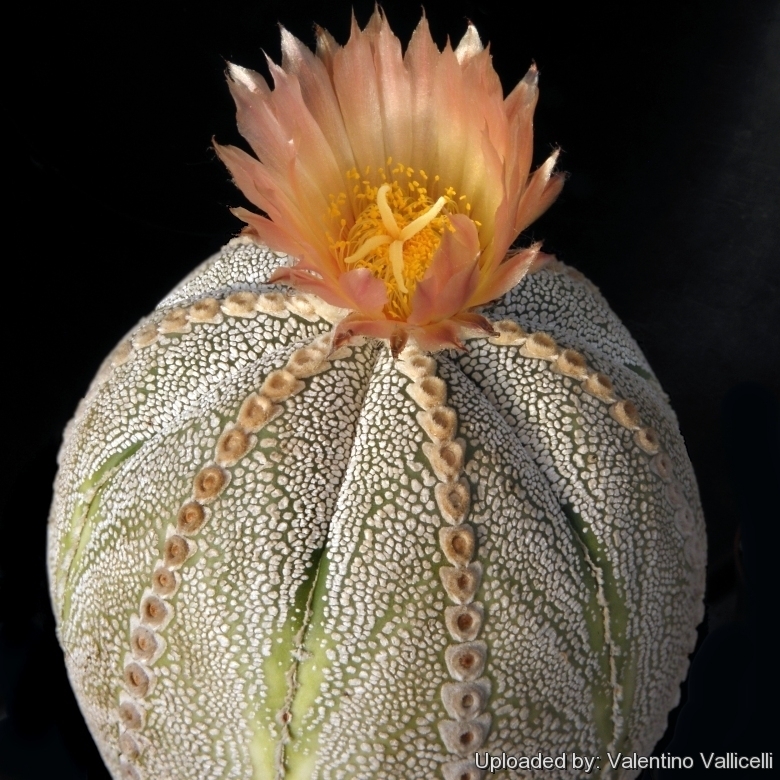 Remarks: Compare with the inverse hybrid Astrophytum hybrid ONZ-AS (A. myriostigma cv. 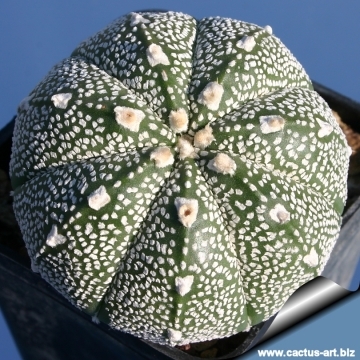 Onzuka x A. asterias) which is similar but with (usually) only five ribs. 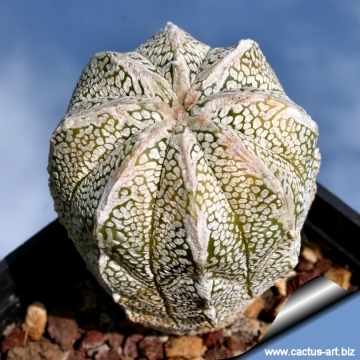 Astrophytum hybrid ONZ-OR (A. myriostigma cv. Onzuka x A. ornatum) cv. White Zebra: (a.k.a. 'White Tiger' type) is a selected, very white form with V-shaped, white wolly flecks, forming a stripped zebra like pattern. Astrophytum hybrid ONZ-SK V type (A. myriostigma cv. Onzuka x A. asterias cv. Superkabuto): it has inherited by "Onzuka" the 5 fairly sharp ribs and by the "Superkabuto" the large white dots, and often shows fly or V shaped patterns around the areoles. 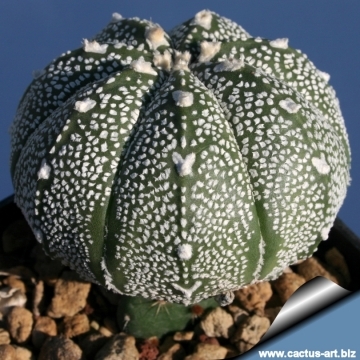 Be careful: The epidermis of this hybrid is harder than in the normal asterias or myriostigma and cracks easily if plants are overwatered. Propagation: By seeds, remembering that seedlings dislike strong light and dry conditions and need to be repotted frequently. Eventually, as they become mature, they attain a maximum size of 8-10 cm (20) cm. But plants are often grafted to accelerate growth as they would generally take at least a five years to reach maturity on their own, but the grafted plants are typical rather tall growing, compared with plants on their own roots that are usually more flat to the ground.